Large black plastic boxes fill my room and my office space, slowly being filled with clutter and accumulated trinkets purchased from Amazon or Think Geek. In goes my Pathfinder RPG books and playmat. On top I’ll pile my varied assortment of Arduino parts and Raspberry Pi boards, stuffed next to my portable geology kit. Before the lid is closed, I’ll fold and tuck in my going away present from my office mate, Donald Holt, a Hawaiian shirt in my university’s colors with the words, Sun Devils, printed across the pattern. I’ll save my books and throw out my bath robes. I’ll save my DVD’s, but give away my coffee maker. I’ll pull off hundreds of TV show episodes and movies down from the Morale Drive and tuck a 4 terabyte enclosure into my pelican case, next to a full size telescope my family sent me for Christmas. My work friends will say their good byes to me and I’ll accept a few more friend requests on Facebook or LinkedIn. One or two people will make plans to come out to Phoenix, and with my Sea bags ill take home a ton of memories and lessons. I’ll leave my fully automatic rifle in Germany. I’ll leave my expeditionary gear in San Diego, and when I board the flight back to Arizona I will be down to a backpack. I will buy a car. I will register for spring classes. I will repaint my house. I will forget Afghanistan. Welcome to Mars! 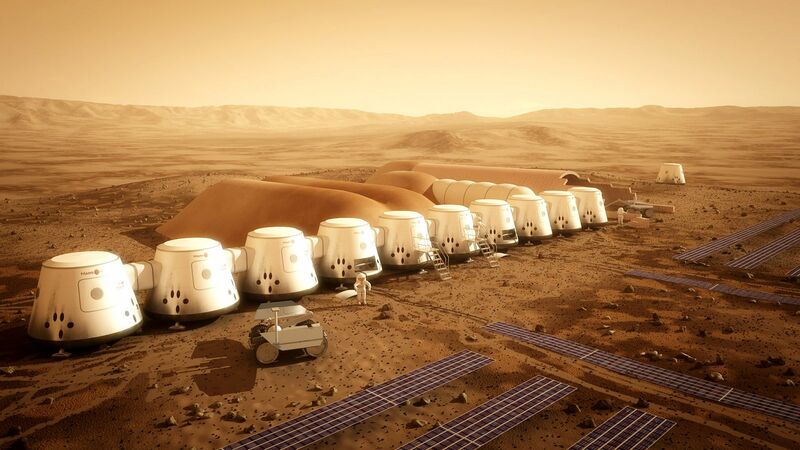 You and your fellow colonists have just landed on the red planet and are beginning to build your new home. As you unroll your solar cells and set up your green house, what will you use to clear rocks from the site? What did you bring with you that will collect soil for processing into raw materials. How will you build roads, dig ditches for ice, and bury habitats in regolith to protect them from radiation? Hand shoveling in space-suits is a waste of time and an unnecessary amount of radiation exposure. That big complicated, sub-contract built rig NASA sent with you is going to break down eventually. Plus, to support that monstrosity, you’re going to have to send a dedicated primary and a secondary expert on that entire machine, a cart-load of replacement parts, and you still might loose it to a critical failure if you roll over on an uneven dune. The cost of interplanetary shipping makes sending heavy equipment and parts cost prohibitive. What you need, instead, is the simplest machine you can devise to do the job, reducing the number of parts that can go wrong. You need a power supply for that device that can be swapped out, not unlike the rapid charging stations for the Tesla roadster. Maybe a power supply that can run a tractor, a brick press, a back hoe, or any number of simple jobs that require applied force. You need an entire ecology of devices designed to work simply and together, devices you could manufacture, or 3-D print, in the equivalent of a university machine shop instead of a factory. Easy to operate, repair and assemble, theses devices will be the workhorses for your new world. A year ago when I was pondering these problems, I came across a TED talk by Marcin Jakubowski, PhD of Physics from University of Wisconsin. In his talk he described a collection of devices called the Global Village Construction Set, a whole ecology of devices, designed by the online community to overcome the myriad of problems inherent in commercial industrial and agricultural equipment: planed obsolescence, over design, difficulty of user-based repair, lack of standardization in parts and power supply, all of these driving up the cost, commonly over 400%. While Marcin was building the Open Source Ecology project to liberate the user and the third world from corporate monopoly on resource extraction, I discovered that his ideas would work just as well to liberate a budding off-world colony from a crippling over-dependence on earth-based equipment and parts. I have decided to build a team to construct one of OSE’s LifeTrac’s and test it at the Mars Desert Research Station in Utah. Some of the research we would like to do includes: operating the machinery in a space suit, adapting the LifeTrac to be driven using a teleoperations suite, and testing the equipment in a Mars-analog environment. We are going to have to raise the money to fund these plans, I’m currently estimating at around 15-20 thousand dollars. We are going to need a lot of man-hours during this fall at Arizona State University and two weeks in the winter on site in Utah. In the end I’m hoping to get a lot of good data from this project, and a prototype that may one day be used to build a home on another planet.